Whether you’re planning on setting up your first dental practice or you plan on renovating an existing dental office, undertaking a dental construction project can prove to be quite an uphill task. Your project could be end up being faced with quite a number of pitfalls along the way. However, with the right crew and the following set of helpful advice, realizing your dreams of building your very own dental practice doesn’t have to be such a daunting task. Performing due diligence of the sites under consideration will be extremely important before going ahead with the final acquisition. A thorough comparative analysis will need to be done. This will involve the evaluation of factors such as the sites’ accessibility, utility availability, topography, future growth and other requirements that may affect them. Proper due diligence will entail the conducting of a formal survey, soil boring exercises and further assessments of site. This will help reduce the probability of complications arising in future which could otherwise slow down the construction process or lead to an increase in project costs. *Oversee the project from its onset to completion. *Provide you with construction designs of a dental office that meets your desires. *Cut down on construction costs by helping in the prevention of unnecessary spending and fines. 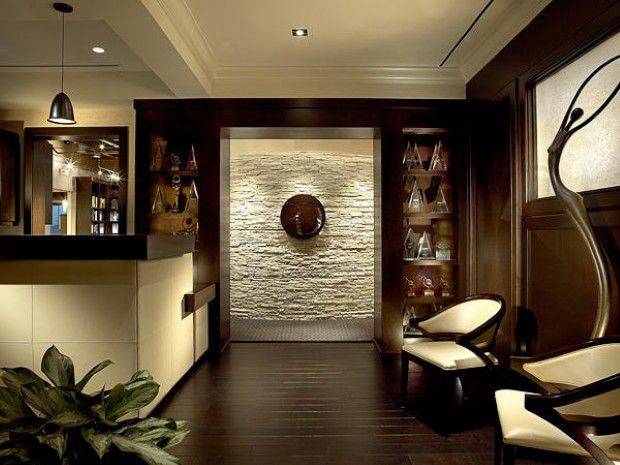 *Ensures that the office stays open while some of the remodeling projects take place. At times, what you’re willing to spend might not be considered to be a realistic budget. Therefore, speaking to a professional with prior experience in construction of dental offices similar to what you have in mind will help you come up with a realistic budget. Involving a professional in the budgeting phase will help you draft a more comprehensive financial plan that’s inclusive of all the unique dental office requirements that you might not know about. This will help in avoiding any unexpected costs that might arise as the project progresses. To ensure that the construction process does’t end up dragging on longer than is necessary, it’s important that the entire process is done in an orderly and timely manner. Therefore, time should be allotted for the design, tendering, permit and the construction processes. You should then try to make sure that none of these processes takes longer than the duration that is allotted to it. This will be important if you already have a team of employees. Engage with them in order to familiarize yourself with their needs and wants regarding the new dental space. Doing so will ensure that the construction project takes their needs into account hence maximizing their efficiency in the new dental space. Speaking with the staff will also give them a realistic understanding of how the construction could possibly affect them. Although it might be time consuming, competitive bidding could help you get the best pricing and services for the construction of your dental practice. You might end up realizing that you could be getting more than what your current architect or engineer is offering you. For a proper competitive bidding exercise you will need to develop a Scope of Work document tailored for each service provider then let them review and sign it before giving them a chance to provide a proposal. Once you have a number of proposals handed over to you, you can then compare and select the best vendor for the construction project. *Bid Requirements drafted on the final contract between you and the design team. This will ensure that your service provider enforces everything that was agreed upon during the bidding process. *Construction drawing should also be referenced by the contractor in a contract. The contract should also contain details of the revision dates in case of any eventuality. It is extremely important that you take your time to carefully go through the contracts from your design team. Clarify on issues that you do not understand regarding the contracts and also have an attorney go through them before signing them. Make sure that the attorney you’re consulting is familiar with construction documents. Investing in an equipment planner will ensure that the necessary dental equipment are procured early enough. Early procurement of dental equipment will ascertain that there are no unexpected changes in the pre stated budget as the construction project progresses. It will also allow for the integration of the dental equipment into the construction drawings hence eliminating delays and setbacks during the construction. The only way your new office space desires will be realized is if you take an active role during the design process. This doesn’t necessarily mean being there through every construction process. It means that you should participate during the review meetings that take place with the design team. You should also have a discussion with your architect and clearly state the type of feel and touch that you want the practice to give off. Partnering with a dropshipping supplier to pack and ship your products means you can efficiently save time and money, which is what the best dropshipping eCommerce businesses do! However, there are other costs involved in using this method and these can affect ongoing sales. Once you have secured a dropshipper with product availability you need to insure that they can ship the items in a timely way. If you skip this part of the deal, you’ll lose your customers and money. Depending on where you are located, 2 to 3 days may not be good enough. You need to be aware that consumers are still transitioning to purchasing products over the internet, from previously buy at a brick and mortar store. They have become accustomed to getting their products immediately and they’ll expect the same when they purchase from an eCommerce store. Again, this will also depend on what they are buying. You’re going to need a supplier that ships the very same day or at the least, the next day after payment is made. Suppliers who do not do this are doing you a disservice and they’re going to cost you a lot of potential repeat sales. The best dropshipping eCommerce fulfillment always insist that orders be shipped the very same day or the next day after payment. This is not that difficult to do. This way of doing business was unheard of twenty years ago. Companies who embraced this strategy increased their strategic advantage over those who did not. Any successful company sells today and ships today, or the next. This is the norm for most. You must treat your customers the same way you’d like to be treated. Always consider the customer and their happiness. Respecting them is giving them more than their expectations. 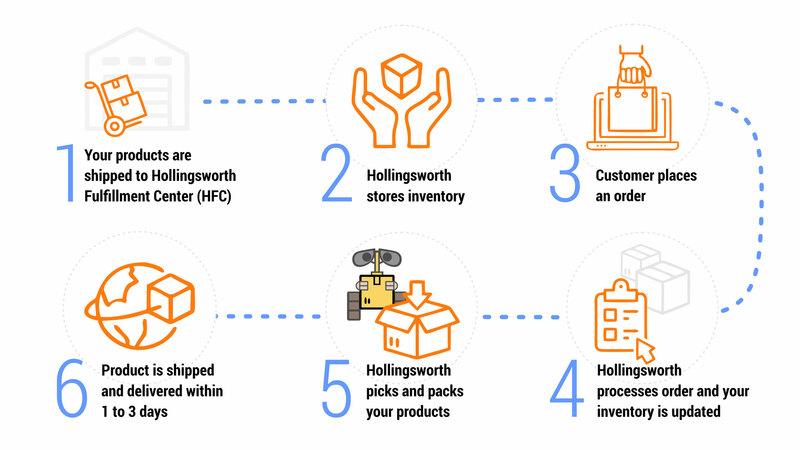 By placing an order with the dropshipping company yourself you’ll be able to fully observe their process. As a customer you’ll experience whether they live up to their shipping policy. Even the best drop shipping companies use the major carriers like U.S, Postal Service which can take a week to arrive after shipping. Priority mail usually takes up to 3 days. You also need to know exactly what the shipper charges, excluding the drop ship fee which is standard. You must weigh your package and check the rate charged against the cost of the service that shipped the item. Bear in mind that common carriers often negotiate discounts. However, if your charge matches the consumer level rate, it should be fine. If it is far higher then you are being cheated. Additional costs may be acceptable when there is no standard drop shipping charge involved. The cost of packaging can also be considerable. Ask the shipper if you are not happy with your fee. However, do not confuse this with a handling fee which is associated with retail purchasing. The standard drop ship fee is about $1 to $5. This would be your handling fee. Dealing with a supplier who pads the shipping costs is unacceptable. Suppliers must reflect all recovery costs in the drop shipping or handling fee. For families that have average to above average storage needs, you may be looking to increase your current storage options. Though renting a storage space at some nearby location may seem like a reasonable option at first, many of these places can be quite expensive over time and will also not offer you the opportunity to build any additional equity in your home. Taking advantage of the many at-home storage options that are currently available for you to choose from will not only offer you the convenience of having your things nearby, it will also enable you to create something that can exactly fit your current set of needs. Whether you are looking for a place to store gardening supplies, an outdoor vehicle, or anything else, you should be aware that you will certainly have a lot of options to choose from. Over the past few years, there has been an increased amount of interest in using Amish built sheds in order to meet general storage needs. 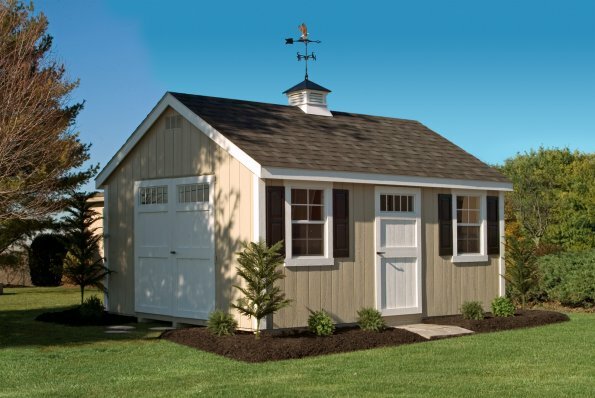 These sheds are typically well-built, highly customizable, and constructed using a time-tested set of values. Though you should obviously consider all of the possible options available before making any final decisions, you may be surprised just how affordable and accessible a custom-built Amish shed can be. This article will briefly examine the many different types of Amish sheds that are currently available for you to choose from. It will also discuss the benefits of choosing a shed that was built by the Amish and how to determine which type of shed can best meet your family’s current storage needs. Naturally, because there exists such a diverse array of potential storage needs, there will also exist many different types of sheds that you can build. The type of shed that will make the most sense for you will depend on the items you are intending to store, the climate that you live in, and the amount of money that you are currently willing to spend. Generally speaking, most traditional types of Amish sheds can be categorized in one of three possible categories. These categories include standard sheds, colonial sheds, and Victorian sheds. Though, depending on the specific shed builder, these categories can sometimes be rather broad, understanding the differences between them will make it significantly easier for you to make a final decision. Standard Sheds are often the most affordable because they are the simplest to build. However, in accordance with Amish culture, despite their simplicity, these sheds do not sacrifice quality nor attention to detail. Depending on your climate and storage needs, you may want to incorporate various types of doors, vents, and even windows. You will also want to consider the many “styles” of standard sheds that can satisfy your aesthetic preferences. The primary differences between these styles of sheds are their overall shape, the angles of the roofs, and whether or not the roof extends outward to provide an awning. While a standard economy shed will be on the simpler end of your available options, the features you will find in a standard cottage will be considerably more complex. Like the series of standard sheds mentioned above, there also exists a wide variety of Colonial Sheds that you will have to choose from. The primary differences between a colonial shed and a standard shed are their building materials, their intended use, and their overall aesthetic appeal. Typically, colonial sheds will cost slightly more than their comparable standard counterparts, though they are still considered to be quite affordable. Colonial sheds offer their owners a wide variety of aesthetic choices including the incorporation of exterior wood, shutters on the windows, attachable flowerboxes, and numerous other options. These stylish spaces are available in A-Frame, Dutch, Cottage, and Hip Roof styles. They are ideal for individuals who are hoping to add a little bit of flair to an otherwise traditional storage space. Similarly, Victorian Sheds also have a very firm commitment to being aesthetically appealing. With the right customization options, a Victorian shed can be easily modified to seemingly mimic a miniature version of a home. These beautiful—yet functional—sheds are ideal for at-home workspaces, pool houses, natural-light recreation areas, and numerous other functions. In addition to the styles you will find available with colonial sheds, Victorian sheds also offer a model frequently referred to as the Ponderosa. Ponderosa’s are incredibly detailed and may even function as a living space for guests. In addition to building sheds, many Amish shed builders will also offer a variety of different garages for their clients to choose from. If you live in an area that is frequently exposed to the elements—heat, cold, rain, snow, hail, etc.—then you know that having a reliable place to store your vehicle is absolutely necessary. The most common types of Amish built garages include double wide A-frame garages, Dutch barn garages, Ponderosa garages, and garages that are custom-built to satisfy a specific set of needs. In addition to being quite useful, adding a new garage can contribute a significant amount of equity to your home. Depending on your current lifestyle and living situation, you may be looking for a decent place for your animals to live. Unsurprisingly, as a culture that has such a proud history of animal husbandry, many Amish shed builders will also offer options that are specifically designed for animals. For example, even if your dog is typically an indoor animal, building a dog kennel can help provide them with accessible shelter in the cold of winter or the heat of summer. You may also want to consider investing in a chicken coup or a horse barn. These sheds are traditionally designed to be highly functional (featuring easy access for feeding), aesthetically pleasing, and also able to last in all climates. In addition to the more functional types of Amish sheds that are mentioned above, many shed builders are also equipped to build structures designed for recreation. For example, adding a gazebo, pergola, or pavilion to your backyard can easily help convert it into the perfect gathering space for guests. Your local Amish shed builder may also be able to provide you with a playset for your children or furniture that is capable of withstanding the elements. Because the Amish have a firm commitment to building quality structures, paying attention to every little detail is obviously something that is quite important. With an incredibly wide array of customizable options for you to choose from, building the outdoor structure of your dreams is something that is surprisingly well within reach. One of the first things you should think about is the types of latches and hinges that you hope to incorporate into your shed. For example, if you have built a horse barn, you may want to consider using a corresponding horse barn latch. Other possible options might include a D latch, a Victorian latch, and a wide variety of possible hinges. Things such as dormers, interior details, vents, and lighting packages will all also require client input throughout the customization process. Additionally, flowerboxes, ramps, gutter systems, and boot returns can all usually be adjusted in accordance with your tastes. The customization process can often be incredibly detailed. The color of your shed and the styles of windows that you use will all need to be accurately accounted for. Taking the time to create a budget, look at your possible options, and think about the factors that are specific to your needs—intended uses, climate, aesthetic preferences, etc.—will be undeniably worth your time in the long-run. Why choose Amish built sheds? There are many different reasons that you may want to consider building an Amish shed or other type of outdoor structure. Not only will these structures be built according exactly to your preferences, but the Amish community also has a proven history of avoiding cutting corners and assuring that quality prevails above all else. Your custom shed is being built on your property and it is important that you are able to get the attention to detail that you deserve. Because of their distinctive pride in their work, commitment to mastering their craft, and ability to pay attention to customer needs, using an Amish shed builder should certainly be considered a viable option. This article is a detailed list of the top 5 star players of the Redskins. Please keep reading to learn the most important information about each of the Skins’ top stars. Also, please visit super star tickets and find cheap Redskins tickets. If you are an American football fan and don’t know this team player, you must be sleeping under a rock. Robert Griffin III has established a strong quarterback for the 3 seasons he has been with the Redskins. He represents the Washington Redskins as number 10 in the NFL. He’s an iconic player of the NFL. Born in February 1990, he’s an impressive 24 year old youngster. He has a weight of 223 pounds and a height of 6.2”. Trent Williams represents the Redskins, as number 71, in their offensive left tackles. He’s one of the top left tackles in the NFL. He’s an all-round team player capable of run blocking, pass protecting and defense against screens and misdirection plays. He was born in 1988, meaning he’s 26 years of age. He weighs 318 pounds with an average height of 6.5”. Alfred Morris is another strong player with great running abilities. That’s why he has established himself for the running back position of the Redskins. His running back abilities are further enhanced by his vision, great lower body strength and balance. Other than his running capability, he’s also an incredible passer. He plays number 46 for the Washington Redskins. He was born in December 1988 – he is 25 years of age today. His weight and height are 219 pounds and 5.10” respectively. Pierre Garcon plays as a number 88 wide receiver for Washington Redskins. He has represented Redskins in 7 NFL seasons. Pierre is a great motivation to the other players as it is evident in the Redskins’ win-loss records. He has the tactics of opening up the opponent’s defense. He is capable of reaching and catching a pass 20 yards down the field – simply, he’s a catcher. Pierre Garcon is an experienced Redskins player with the age 27 years. He’s 210 pounds heavy and 6.0” high. Despite the injuries that have been holding him back, Brian Orakpo is a gifted Washington Redskins’ linebacker. His gameplay identity is number 98. He has improved significantly on his run defense, bearing in mind that injuries had ruled him out of the game for some time. Brian is a great athlete with the best pass rushing technique in the NFL. Born in July 1988, he’s 27 years of age. His weight is 260 pounds with a height of 6.4”. The above list and description of players is part what defines the success of Washington Redskins. Do you want to meet these and many other Redskins’ star players? If so, make sure you purchase an advance ticket for yourself, so that you’ll be able to attend some great games this season. Influential 80’s English new-wave band Echo and The Bunnymen will be playing at the Saint Andrews Hall in Detroit, on August 11, 2014. The band first broke into the UK charts with the release of their first album “Crocodiles” back in 1980. And with their debut album reaching the UK top 20 charts, it garnered them instant cult status within the UK music scene so buy concert tickets online to save a bundle. But it was not until 1984, with the release of their third album “Ocean Rain”, that the band achieved worldwide success. The album spawned massive mainstream hits like “Seven Seas” and the anthemic “The Killing Moon”. Ocean rain is considered as one of the most influential albums of all time, with the tracks on it still being used on movies and TV series, and is responsible for the band’s longevity in the music scene. For “Echo” fans, an Echo and The Bunnymen album was always a tape deck staple back in their younger years. Unlike its peers, the band’s music transcended the lines between punk, new-wave and early Goth with just the right doze of pop. This explains as to why their music was embraced by a far larger audience back then, and as to why it is still considered relevant even up to now. And because of that, the Detroit music scene is abuzz with anticipation for the upcoming “Echo” concert. The Echo and The Bunnymen Detroit concert is in support of their new album, “Meteorites”, released just this April under 429 Records. The new album starts off, with its opening track “Meteorites”, with the familiar echo style of slow, melodic but dark, string accompanied, guitar riffs. The track then slowly builds with every chorus, with Ian’s haunting vocals drawing you ever deeper into the track. It is then followed by “Holy Moses” which has a more “joyful” feel, but with the all too familiar reverberant Echo style. The next track “Constantinople” takes you on a more edgy ride with typical “guitar style rock” with an eastern sounding twist added to it. After that, the album then takes the listener to the more personal track “This a Breakdown” where Ian talks about his struggle about drug addiction. Ok, I’ll leave it there as I don’t want to spoil your music journey of their new album. So if this article made you reminisce about your younger years listening to them on your trusty tape deck or turntable, then be sure not to miss them live this August. The Pittsburgh Steelers play their home games in Heinz Field, and the groundbreaking ceremony for the stadium was held in June 18, 1999. Construction began the following month and by May of 2001, the turf was being installed. In July 20o1, Heinz got the naming rights and the stadium was officially opened on August 25, 2001. In October 7, 2001, the team hosted the Cincinnati Bengals in its home opener and they went on to win this game 16-7. Purchase your Pittsburgh Steelers tickets today to witness more epic games of the sort. Heinz Field is located in the North Shore neighborhood of Pittsburgh, Pennsylvania. It has a capacity of 65,500 and there are 129 executive suites. There are 24 restroom facilities each for men and women, with 8 family restrooms. The stadium has 47 concession stands, 7 team stores and 15 novelty stands. It has 7 passenger elevators and 2 freight elevators. 5 escalators and 4 pedestrian ramps can be used by the football fans. The stadium hosts many events, including Pittsburgh Steelers football, University of Pittsburgh football, concerts and other public events. One interesting fact about the stadium is the fact that its playing surface is natural bluegrass and despite criticisms from many quarters, players, coaches and even opponents lobbied to keep it. Despite the field’s outdoor experience, it’s never frozen because of heating system tubes that were installed under the field. No matter the outdoor temperature, the playing surface is kept warm, at 62 degrees Fahrenheit. This ensures that games can be played throughout the year. Heinz Field is located near the Monongahela and Allegheny Rivers. The open bowl style of the stadium gives the fans a lot more than a football experience. Fans can enjoy wonderful views of the river and downtown Pittsburgh. Other places that are visible when you’re in the stands include Mount Washington, Fort Pitt Bridge and Point State Park. Getting to the Heinz Field stadium can be difficult at times because of traffic congestion. However, fans can reduce the traffic jam if they use public transport to reach the venue. Once you get to the stadium, you can find additional attractions that add a little luxury to the experience of going to a football game. You can visit the Great Hall, which provides a history of the team. The city skyline provides a breathtaking sight, especially during the night. Outside the field, there is a statue of Art Rooney, who founded the Pittsburgh Steelers. It’s one of two remaining remnants from Three Rivers Stadium, the other one being the Gate D spire that stands in the backdrop. The Washington Nationals is home to some of the best baseball players in the world. Just like any other team, the Nationals too have their top players that keep them going every season. With reference to individual ability, leadership, value added to the team and sportsmanship, here is a detailed list of the top players of the Washington Nationals. Make sure to buy your Washington Nationals tickets quickly to see your favorite players. Bryce is without a doubt a fan favorite among the Nationals faithful. The 21 year old youngster has managed to prove himself repeatedly on the pitch that he is a top player. He is the only true five tool player in the Nationals team. The boy has even improved since in his sophomore season, he had 100 fewer plate appearances yet his RBI numbers and home runs were almost the same from year1 to 2. Bryce is arguably the highest ceiling of any player in the Washington team and may also be the most talented. Jayson is one player that that the Washington Nationals can’t afford to lose. He is the most indispensable player in the Nationals roster. In the year 2013, he managed to lead his team in runs battled and runs scored. He is a solid fielder and a fan favorite. The 34 year old also provides unparalleled leadership by not only being the team’s oldest player but also but also being the only one in the team to have won a World Series. He has become a household name and with a few years left in his contract, he will without a doubt be in Washington colors in his sunset days of his career. The 2013 campaign was not one of the best for Ryan. His play on the corner was erratic and he was unable to complete plays on routine groundballs. Nevertheless, Ryan still remains as one of the best players in the Nationals team. At the plate, he had a career low of 275 batting. Despite it being a career low, it was good enough to put him fifth in the team in that category. Despite the adversities he went through, he still managed to lead his team with 26 home runs and 84 scored runs. He is one player that knows the Washington Nationals organization very well and one of the best in the team. The aforementioned players are the cream of the crop of the Nationals team. They possess immense talent, proven leadership on the pitch and a great attitude that sets them apart from the rest of their teammates. Is Anything Wrong with the Dodger Blue? At the beginning of the 2014 season, the Los Angeles Dodgers were the clear choice to represent the National League in the World Series so get your discount dodger tickets before they get to expensive during the season. After 101 games, the Los Angeles Dodgers are tied with their hated rivals the San Francisco Giants for first place in the National League. The clear strength of the Los Angeles Dodgers is their starting pitching. Led by ace Clayton Kershaw, a likely choice for the National League Cy Young award, the Los Angeles Dodgers rotation is one of the best in the major leagues. In fact, the only starter currently with a negative WAR is Dan Haren. For those who don’t know WAR stands for wins above replacement, which is a statistical measure of how many wins the said player has above a normal replacement level player. In fact, another 2 of the Los Angeles Dodgers starters, Josh Beckett and Zack Greinke are also in the top 10 in WAR amongst National League pitchers. Josh Beckett and Clayton Kershaw have each already thrown a no-hitter this season, which is amazing since the average for no hitters in a season for the whole league is two, and this team had 2 themselves in about half a season! The Los Angeles Dodgers bullpen has been a bit of a mixed bag. Some players, such as J.P. Howell and Brandon League have had a great season, others such as Brian Wilson, former San Francisco Giants closer and owner of wild hairstyles and beards, have had awful ones. The Los Angeles Dodgers have a good, not great line up. Yasiel Puig is the star of the team, but they have other quality players such as Dee Gordon (45 stolen bases in 101 games, the most in the National League) and Hanley Ramirez. One issue the Los Angeles Dodgers have had this season is their outfield alignment. Matt Kemp, the normal center fielder, is perhaps better suited to play right field, but manager Don Mattingly is hesitant to put Puig, an outstanding fielder by all means, in center field due to fear of injury due to Puig’s fearless style of play. As you can see, not much is wrong with the Los Angeles Dodgers at the moment. The team as is currently constructed could win the World Series, that doesn’t mean they haven’t been mentioned in trade rumors. Some rumors even have them landing Tampa Bay pitcher David Price or Philadelphia Phillies pitcher Cole Hamels, that would definitely be a case of the rich getting richer. Dallas is Going to Have a Rough Year! Do You Know the Best Players on the Dallas Cowboys? Dallas Cowboys is an American football team that has earned its reputation from the classic style of gameplay they bring to their games so get your Dallas Cowboys tickets today. Although the team isn’t especially innovative with their strategies, their fans love them because you know what to expect when you see a Cowboys game. The team has invested a lot in building a very strong team that any opponent in the NFL will fear facing. Its performance in the pitch is a clear indication of an immense pool of talent that they possess. Apart from recruiting the already polished talents, the team has also nurtured its own talents who are now performing quite well for this team. Here are some of the current top 5 players in the Dallas Cowboy team this season. Dez Bryant is the most valuable player on the team that the Dallas Cowboys have today. He is the best overall player and the whole team depends on him. His maturity in this game has been awesome since when he started playing for Cowboys. He is on the tough wide receiver (WR) position which he handles quite well. His ball fighting ability makes it hard for defenders to keep up with him in the pitch making it easy for Cowboys to dominate any match. He is a very important factor to consider while assembling a team and this might be the reason to why he is positioned second best. He takes the role of quarter Back player and whenever he is on the field, he gives the best to the team. It is hard for Cowboys to lose a game while he is playing. He is very disciplined and hardworking, and this has earned him a good reputation even off the play field. The talent of Tyron Smith has been well used by the cowboys to build a very strong squad. Playing the OT position he is very instrumental in protecting the quarter backs while pushing the game forward. He is very strong and rarely misses a chance when it comes is way. His input in the team is very vital and no one can currently out play him in his OT position. He is very consistent in the performance and this has earned him a position in the team squad for sometimes now. He plays the receiver position and his combination with quarter back Romo is just amazing. He is always the target, especially on third downs and clutch situations. This could be the reason that he is rated fourth best player this season. Murray is the fifth best Cowboy this season, but still a very important factor on the team. He is very aggressive and versatile on the field. This summer in Chicago is proving to be one of the most diverse, exciting and entertaining yet. Here are 6 of the coolest concerts in Chicago showing in August. There’s bound to be one live performance you just have to see so get your cheap concert tickets for sale on the web today! For one night only on Aug 5, Tori Amos plays the Chicago Theater. Tori has sold over 12 million albums during her musical career. She is well known for her outspoken activism on diverse subjects such as gay rights and sexuality and is a heavyweight humanitarian. Katy Perry joins indie duo Capital Cities at the United Center. This colorful and un-miss able tour supports her new album PRISM. This is her first tour since 2011 so expect an amazing performance. Katy has designed the stage herself to get nearer her fans in the arena. And spectacular costumes are bound to shock and surprise. The queen of soul pop, Chaka Khan, appears for one night at the Chicago Theater. Still going strong after 22 albums and 40 years in the music business, this is a concert not to be missed. When not recording albums or touring, she still has the time and energy to devote to the Chaka Khan Foundation which promotes protection for women and children. All One-Directioners are in for a treat on 29-30 Aug as Harry, Liam, Louis, Niall and Zayn star at the Soldier Field Stadium as part of their ‘Where We Are’ tour. This pop sensation has already toured the USA once and is back again. It was only 2011 when their debut album, Up All Night, climbed straight to No. 1 in the US charts. For the heavy-metal side of rock ‘n’ roll, Motley Crue are playing out their last ever tour at the First Midwest Bank Ampitheater on 8th August. Joining them is another giant of bad boy behavior, Alice Cooper. Yes Alice is still going strong after all these years. And yes, this definitely is the last chance to see the Crue. They have made it legally binding that no future tour is possible. Not one, but two legendary rockers appear on 16th August at the All State Arena. Santana and Rod Stewart join forces to put on an incredible concert performance combining Santana’s legendary guitar skills with Rod Stewart’s unmistakable voice. This extraordinary tour is an electric combination you don’t want to miss. So whether you’re a screaming One-Directioner, a soulful Chaka Khan fan or a head-banging Crue follower grab some tickets and head out for a wild night of consumer consumption. Love is not about believing your partner is perfect, but about loving your partner and their faults. This simple idea is the concept that makes a comedy memorable. Anyone can be mean spirited, but to show some heart while mercilessly mocking someone, something, or, in the case of the Book of Mormon, an idea and a faith is what allows a comedy to not only become a 2011 Tony Award favorite, but find a lasting place in the soul of an audience. Go online to find cheap Book of Mormon tickets! The Book of Mormon is no different than that first chapter of many movie franchises (oh, and it will become a movie too, if the Deadline reports of talks between the producer Scott Rudin and the creative team are true). The Broadway musical takes the Mormon religion and its doubters (in this case the inhabitants of a Uganda village plagued by war, poverty, and starvation) to an extreme. The Mormon missionaries are either disappointed (Elder Kevin Price) or searching for a place in the world (Elder Arnold Cunningham). The villagers are as crass and disrespectful of any attempt to convert them as possible. Yet, each side discovers that religion, or faith, provides what everyone needs. Price learns that being a brother is not all about jetting off to Orlando (the best place for a Mormon to work/convert) and discovers his true faith; Cunningham finds that despite his lack of knowledge (he simply begins taking cultural references from Star Wars and Lord of the Rings when he has no answers to the villagers questions) he can still help people; and the villagers find that faith in something or someone can be uplifting in dire circumstances, though they do not feel the need to ultimately take the Book of Mormon literally. Certainly, the Book of Mormon is not the first attempt to satirize religion, but it is one of the few attempts that is able to succeed in performing as both a work of satire and a work of respect. Trey Parker and Matt Stone certainly had the experience coming into this project to walk that difficult line. South Park, their popular Comedy Central show, remains as groundbreaking an animated series as it began, following the misadventures of four foul mouth children as they make light of the ridiculous and hypocritical adult world as only a child can. So, once again, the Book of Mormon Broadway musical is not just a satire, but an unrestrained love affair that appreciates both the ridiculousness of organized religion and the power that faith, however tempered, can exude in the worst situations.